The key to happiness is being rich, successful, and beautiful...right? Martin Thielen, best-selling author of What's the Least I Can Believe and Still Be a Christian?, insists that this is far from the truth. Happiness, Thielen argues, does not come from external factors like getting a job promotion or finally reaching your goal weight. Rather, happiness is an inside job. In brief, easy-to-read chapters, Thielen offers ten traits of happy and fulfilled people. Using psychological research, personal anecdotes, and Scripture, Thielen begins the path to contentment by showing how life circumstances—including income, health, physical appearance, and marital status—only account for about 10 percent of a person's overall life satisfaction. From there, he offers alternatives to the frequent methods we use to make ourselves happy. Instead of aiming to make more money, Thielen contends that expressing gratitude and cultivating optimism are surer paths to joy. Rather than focusing on constant advancement in our careers, let's practice our ability to forgive, to be generous, and to use trials as growth opportunities. These lessons, and much more, help readers who may be dissatisfied in their lives see that authentic contentment is closer than they ever imagined. The book features a guide for group or individual study, which includes questions for reflection and a challenge for each individual to reflect on during the week. 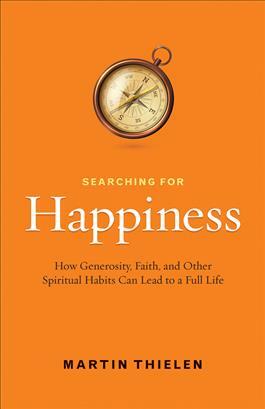 "Martin Thielen's new book, Searching for Happiness, is a captivating read. I read it straight through in one sitting. Using Scripture, science and personal experience, Martin reminds us eloquently that happiness does not come from material things or external circumstances, but rather, real contentment comes from within us. At the end of the day, happiness is 'an inside job!'"